Saint Ambrose Catholic Parish, with its 5,000 families and 16,000 members, works hard to be a strong and active member in the Brunswick community, strengthening the values of family life and service. 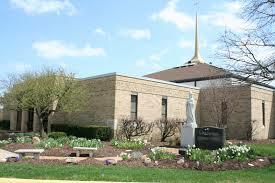 Since its founding in 1957 to this very day, hundreds and thousands consider Saint Ambrose a part of ‘their family.’ Through the 150 ministries and programs, its members form wonderful bonds of friendship, reinforce family values and do great work in service to the Lord and our local community. There is something for everyone at Saint Ambrose. As a community of faith, the parish works hard to respond to those in need. Its efforts provide food for the hungry, support for those who are grieving the loss of a loved one, friendship and encouragement for those who are struggling with the pain of divorce, and so much more. This year, the parish will focus on the theme of ‘family’ through some special efforts to both celebrate that we are sisters and brothers in the Lord, and together we form the family of God. Over the months ahead, Saint Ambrose will offer a variety of special programs to strengthen and support family life. We are blessed to have such a vibrant parish life at Saint Ambrose! If you are in need, or looking for a Church ‘family’ and a spiritual home, Saint Ambrose Parish is a welcoming place for you – all of us, together, as one family in the Lord.